Welcome to Bob's Garden – Permaculture a day at a time. 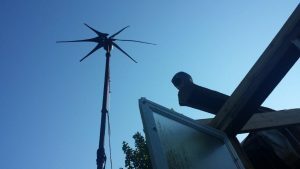 Generating electricity from wind may not be the ultimate Permaculture tool, but in some instances it can certainly be a great backup position. I was born with middle class American entitlements in a time when the whole structure of the American system was being questioned. I was never a bomb throwing radical, although I did attend a protest or two, especially regarding the war in Vietnam. Funny how I thought I knew everything I needed to know when I was young, but gradually have come to the point of embracing my “not knowing” at least as much as my knowing. While the Precautionary Principle may justify some protests—especially with regard to insane projects that may do irreparable harm to people and ecosystems, the overall positivistic approach of Permaculture is really more in line with where I would like to spend my energy. The knowledge is there to feed the Earth’s people-all of them- with healthy organic food. The knowledge is there to shelter everyone. And especially the knowledge is there to do all this and repair the Earths bio systems so they remain hospitable to all creation. Through these developments/designs we demonstrate both our competence and a more attractive sort of lifestyle. One that is both gentle on the earth and productive for us humans. And while individually our efforts may seem meager, Permaculture increases exponentially as we teach by example , and to date is active in 100s of countries. Demonstration projects in Jordan and Sub Saharan Africa are generating larger and larger communities practicing Permaculture, and these communities are both greening the deserts and creating better lives for those living there. China has reclaimed an area the size of Belgium from dust, erosion, and poverty to become green and productive, a place where people can live abundantly and want to come back to. And these projects are going on everywhere, but they don’t sell newspapers, yet. Here in the United States there are still many who have never heard the word Permaculture. It runs counter to economic “growth”, so it is not widely publicized. But economic growth is really not all it is cracked up to be and economic stability might be the better goal. Bill Mollison, the founder of the movement, agreed with one reviewer who called his works seditious, but with the understanding there is never violence or any threat of violence, it is peaceful sedition that includes everyone. The game of masters and slaves only works when lots of people are willing to be slaves. If we grow our own food we reduce jobs in the food industries, this frees lots of slaves and removes pressure from ecosystems. Since Permaculture works on all aspects of our lives, similar freedoms from housing and energy begin to appear, until eventually working for money becomes relatively unnecessary. To be sure there will still be some industry, someone will manufacture solar panels, someone will make bricks for houses, but the net effect reduces our working lives from 50 years down to just a few years of service to the common good for maintenance of the systems.